AND THEY WILL GO SOON…. There are years when I feel that teaching is an obligatory. And there are other years when I have a special chemistry with my students. This year is one of them. I do enjoy being with them in the classroom, though I cannot say that the feeling is mutual, haha…. But I hope that they do not think my presence in class is repellent, either. I am a moody person. Sometimes I am very tolerant. Some other times, I get irritated easily. Maybe it is the time for the first ;). I am teaching three classes of nine graders this year. The first time I was in their class, especially this particular class, some of the boys were very loud. I thought that it would be a hard year for me to ‘tame’ them, or ignore them. Usually I choose either of them. Then I realized that they only wanted me to pay attention to them, to take a closer look. Some of them, who at first seemed to ‘challenge’ me, when they found out that I was okay with their ‘eccentricity’, turned to look at me with different eyes. Oh, yes, they are still eccentric, they will try anything to make me look and comment at them (such as coming into class with weird hair style and shirt, wearing a tiara or headband, acting funny or making funny comments to make us laugh, etc.). But they ensure me that they always do every assignment I give them. 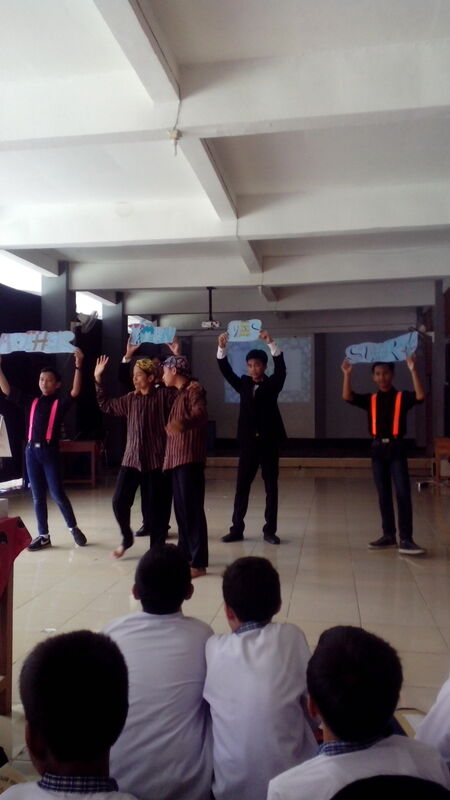 This morning, I saw them perform the final examination on their Art and Culture project. And I was amazed! They did it very well. A really great work for fourteen year old teenagers. Two years ago, I saw them as timid seven graders who shyly said hello and introduced themselves in front of the class. And now, look at them! In less than four months, they will have gone away. They will not be there, on their seats, chatting with their friends, teasing me with their silly answers. I surely will miss them a lot. And next semester, after Lebaran holiday, they will come to this school again, wearing their new High School grey and white uniform, looking different and much more mature, full of smiles and stories about their new school. Kuna was very happy today, he could not stop smiling. He was carrying a bunch of bananas he got from the market. He tricked an old woman there, so now he had the ripe sweet fruits. “Oh, kind grandma, my sister is expecting her baby. I heard she was crying last night. She really wanted ripe sweet bananas. My brother in law has looked here and there, but he got nothing. Can I have just one banana for her so that her baby will be born safe and sound?” he begged. The fruit seller felt sorry for Kuna’s sister. She gave him a bunch of bananas. Kuna accepted the bananas happily. Inside, he was laughing heartily. Of course he did not have any sister. He tricked the old woman so that he could have them for himself. Kuna was actually a good looking and smart young man. Too bad that he did not use his intelligence to do good things. His parents were ashamed of his bad attitude. They always told him to stop this, but he did not listen to them. Sometimes, her mother had to return things or pay some money what he had done to the people. People felt sorry for Kuna’s parents. One day, Kuna heard that Soya kingdom had a beautiful princess named Putri Luhu. He wanted to be the princess’ husband. He was thinking hard to find a way to get her. For days, he was just sitting and daydreaming. He did not do anything to help his parents. Finally, he got an idea. “I will go to Soya kingdom and marry the princess,” he boasted to his friends. “With my intelligence, I will bring the princess home. Just wait and see,” Kuna replied confidently. The next day, Kuna went to the market and bought some nice clothes that noble people usually wore. He tore the clothes on several parts. He then bought a horse and set for the kingdom. Near a forest, he met a young man. “Would you please help me, young man? I am very sad. I feel really guilty to my mother,” Kuna said. “What has happened to you? How can I help you?” the young man asked. Reluctantly, the young man then hit Kuna several times, just as Kuna asked him to. Bruised, -his nose was even bleeding-, Kuna left the young man and continued his journey. Upon reaching the kingdom gate, Kuna put on his noble clothes. Then he lay himself on his horse’s back. The guard saw him and immediately came closer. They were surprised to see his bruised body and torn clothes. They carried him inside the palace. A royal healer was sent for to take care of him. When he was getting better, Kuna was brought to King Soya. “Young man, who are you and where did you come from?” the king asked. King Soya treated Kuna well. He thought that Kuna was really a king’s son. He was good looking, he wore nice clothes, and he spoke sweetly. Kuna was happy to live at the palace. He was treated like a royal guest. Everyone at the palace liked Kuna. The king even wanted to marry him with one of his daughters. But the beautiful and smart Putri Luhu did not easily believe Kuna. She thought that Kuna did not behave naturally. So she decided to investigate him and reveal who he really was. Putri Luhu then called two young men to come inside. How surprised Kuna was to see them! One was his friend from his hometown, and the other was the one he met near the forest. They then told the king about the truth. King Soya was furious. He punished Kuna for tricking him. But thanks to Puri Luhu, because he was not hung to death. He was whipped and had to promise that in the future, he would not use his intelligence to trick people anymore. Tarakani and Wayamoto tribes had been in a long fight. They did not even remember how and when it all started, and it looked like that it would not stop soon. They lived an uncomfortable life. They were suspicious and blamed each other. The children lived in fear. Near the border of the fighting tribes, there were two families. One family lived in Tarakani area, while the other in Wayamoto. These families had two sons of the similar age. They were good friends and always play together, even though their parents told them not to. “Father, why can’t I play with him? He is such a nice boy. He is kind, and he doesn’t mind teaching me how to fish at the sea,” said the boy from Wayamoto. His father could not say anything. His son was right. But the long fight had separated them. He could do nothing to stop it. One day, Kapito Horiwo, the leader of Wayamoto tribe, went hunting to the forest. He had been hunting for a while, but no animals were seen. He walked farther into the forest and arrived at the border of Tarakani tribe. He was about to turn around when he heard two boys talking. He immediately hid behind some bushes. Not far from there, the leader of Tarakani tribe, Kolano Sero, was also hunting in that forest. He saw the two boys, and hid behind some bushes too. “I am wondering why our parents are always fighting. What is the fun of it? And the consequence is, they do not allow us to hang around together,” one of the boys complained. “Me too. When will the fight end? I am tired. Why don’t they just have a ceasefire and we can have some peace? Wayamoto people will be able to buy fish from Tarakani, and in return they can sell their vegetables. We can go playing both to the beach and to the mountain,” the other boy replied. In their respective hiding places, the leaders of the two tribes realized their mistake. The two boys were right. It was no use to continue the fight. They went back home, thinking how they could stop it. When the two leaders were busy trying to find a way, there was a big fight between the two tribes at the foot of Mamuya Mountain. A lot of people died from both sides. The only ones who survived were the warlord from each tribe. Seeing the condition, they agreed to stop the fight and decided that neither won nor lost. They marked the peace by piercing their feet with a sword and splashed the blood on a big rock. They divided the land equally, then went to a place named Luari, and looked at Mamuya Mountain. They saw that the mountain divided the two beaches equally. Then they put a pole to mark the border there. The big rock where they marked the peace was then known as Tonamalangi, meaning the land border.